Attack the Humanoid! : Berzerk Slow Bullets 110,930 points!!! Berzerk Slow Bullets 110,930 points!!! I did it! 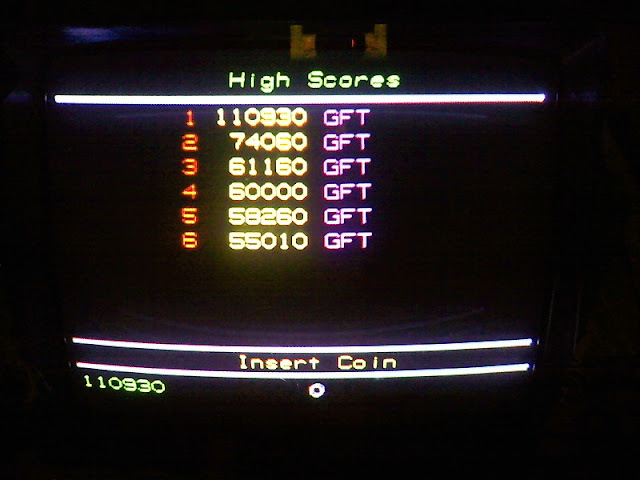 It took just under 2 months of playing slow bullets Berzerk, but I was able to achieve a score OVER 100,000 points, I got 110,930 points in Berzerk RC28 slow bullets tonight! Here is the entire game from booting the machine till the very end when I stopped broadcasting! Here is a picture of my new high score of 110,930 points! Now for the interesting points about the game! The game lasted almost exactly 1 hour and 20 minutes. I went on my 4th man from 32,840 points to 105,840 points! Thats 73,000 points exactly! If I could have gone just 1,060 more points I would have gotten my previous high score on one man! The game started out rough, I made two really horrible mistakes early on in the game and one point I even said "Ugh I'm not going to break my record on this run!" Wow how did I prove myself wrong. This game was special to me for several reason. First my son woke up while I was playing and wanted to come say good night to me in the middle of the game. I even asked my wife if I should turn the game off but she said no, and you can hear him saying the various phrases the game says in the background. Second my wife was able to be there with me when I broke 100,000 points, that is something I will always have to treasure for the rest of my life! When I broke 100,000 the first time, she was with me and that meant the world to me! I was very happy with the ending of the game. I didn't die on a mistake, though going back and looking at the video I might have been able to escape the last maze I was in, to me it was an unbeatable room. Now I have my sights set even higher! The current world record for Berzerk slow bullets done with random play, not the highest score ever, is 178,500 points! That is the score I want to beat! My next goal now is to get to 150,000 points with random play! Berzerk Update and latest Berzerk related finds!